When you think of the brand Coleman, the first thing that comes to mind are coolers and tents. However, did you know that the popular outdoor brand also produces inflatable hot tubs? This fact is a bit surprising, but totally in line with the outdoor recreation products that Coleman manufactures. The Lazy Spa line is one of the renowned portable hot tub or massage spas with bubble jets that the company has in this category. If you haven’t purchased a blow up hot tub ever, you happen to stumble upon a great opportunity. In this article, we are doing one of those Coleman Lay Z Spa reviews to find out whether this inflatable hot tub deserves your hard earned money and a place in your home over most others. 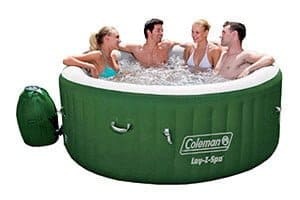 When fully inflated, the Coleman hot tub "Lay Z Spa" has a diameter of 77-inches and can comfortably seat up to six people. Setting up the whole rig is super easy and does not require any tools. The outdoor spa comes with its own pumping unit that can completely fill the hot tub with air in less than an hour. 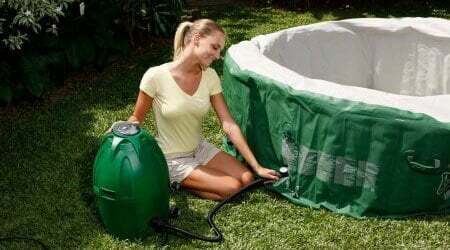 Filling the inflatable hot tub with water is also a breeze through the built in hose outlet. 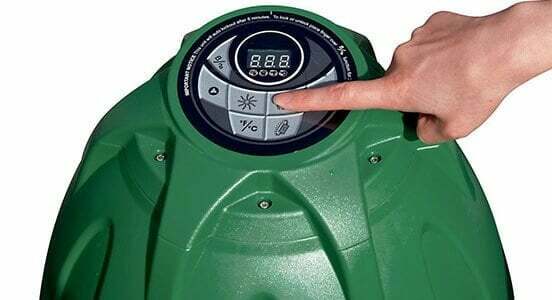 It has a maximum water capacity of up to 254 gallons and can reach this level in mere minutes. Moreover, the tub also comes with rigid handles so you can drag and relocate it when needed. GREAT FOR FIRST TIME BUYERS! The huuuuuge package (heh) also comes with a DVD that explains how to correctly setup the spa and how to maintain it. This added informational material is quite useful especially for first time buyers as it can help speed up the installation process. 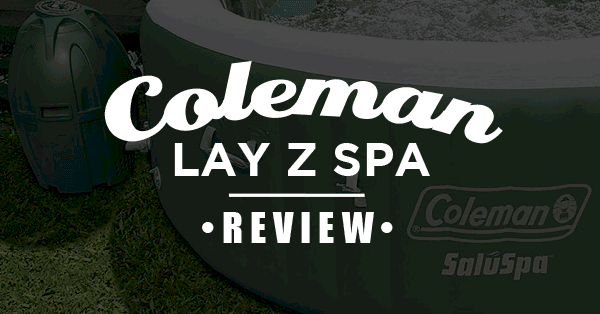 As you’d expect from a Coleman hot tub product, the Lay Z Spa is proven to have superior strength and is durable enough to withstand anything you throw at it. It’s made of a three-fold layer of PVC, leatheroid, and polyester, which makes it very resistant to the elements and other types of damage. It’s sturdy build allows it to resist punctures and scratches. 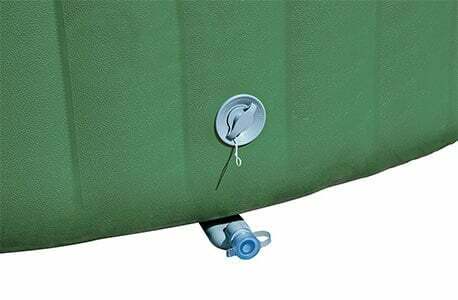 The walls of the inflatable are also designed to withstand overall weight (that of the people in the tub and the water) and other types of activities that would buckle or bend the tub’s thin panels. This is all thanks to an i-beam construction which not only brings a solid shape to the spa unit but also increases its structural strength. Despite its durable design, the Lay Z Spa is considerably lighter than many of its rivals. This is a bit of an advantage especially when you are relocating the tub. Much like other Coleman Lay Z Spa reviews we’ve done in the past, this one wouldn’t be complete without mentioning its key feature, which is comfort. We’ve tested out many other inflatable hot tubs in the past, but this product (apart from the perfect water temperature) definitely gave us one of the most satisfying dips in a long time. It’s got just the right amount of bubbles going out of its jets that it gives you a gentle massage. The engine is also quiet enough that you barely notice it. As such, you can enjoy the hot tub experience without worrying about any noise. Moreover, it’s also nice that they added a digital control panel which enables you to manage every bit of the spa’s operation. It also has that start/stop timer in its heating system which when turned on automatically manages the hot water temperature you set. Another great feature that other Coleman Lay Z Spa reviews missed is the inflatable hot tub’s ability to retain heat for a long period of time. Its heat capability range is at 40 to 104 degrees Fahrenheit which can cater on different individual preferences. Its rapid heating system warms the tub at a rate of 2 to 3 degrees Fahrenheit per hour and in as little as 24 hours, the waters can reach its maximum temperature. Higher heat retention = more time to play! The spa unit also has air pad cushioned floors which is located underneath the tub. This helps with insulation and decreases the heat loss at the base of the spa. As such, you can always to expect a soothing experience while soaking in its warm waters. Even when you use its bubble massage function, the temperature remains almost the same as before. The Coleman hot tub Lay Z Spa is an incredible outdoor hot tub without the jaw dropping price tag and massage system. It definitely makes the shortlist of the best inflatable hot tubs at under $500. Because it's portable and easy to setup, it can be installed in almost every type of home and even beats the Intex PureSpa. The only drawback about this product is the added cost of maintaining the tub’s water quality. Its filtration system requires additional products for it to be fully functional. Other than that, this spa set is a great recreational investment. Overall, the Coleman Lay Z Spa inflatable hot tub is worth every single dime. It has several features that you won’t find in other products in this category. It’s one of the items we have reviewed that we highly recommend, especially for first time buyers of outdoor spa. Disclaimer: All images on this page are property of Coleman. We do not own these images.